Wood-Destroying Insects | Inspector Ed Home Inspections Inc. When people think of wood-destroying insects that damage homes, they usually think of termites. However, while termites are a serious threat to homeowners, they are not the only type of wood-destroying insects that can cause considerable damage. Insects can destroy wood by either eating it or by chewing it to make nests. Certain insects prefer hardwoods while others seek out softwoods. Dampness and decay are sometimes factors that attract insects to wood. The best way to find out if you have an issue with wood-destroying insects is to have a home inspector perform a WDO inspection. Here are some wood-destroying insects besides termites you should know about. These beetles are very small and are less than 1/4 of an inch in size. The larvae do the majority of the damage. Their life cycle consists of adults, eggs, larvae, and pupae. The adults are reddish-brown and are slightly flat with a long body and short head. The larvae will tunnel throughout the wood while feeding. When they are adults, they will bore out of the wood through a small pinhole and leave a fine powder of dust behind. Powderpost beetles only eat hardwoods, so will mainly affect furniture, as most homes are constructed primarily from softwoods. These wood-destroying insects primarily affect structural timbers in moist, poorly ventilated areas. Their name stems from the ticking sound the adults make as a mating call from inside infested wood. The larvae require 13 to 30 percent moisture in the wood and will tunnel in both softwood and hardwood. They are commonly found in pine used in crawl spaces and basements. 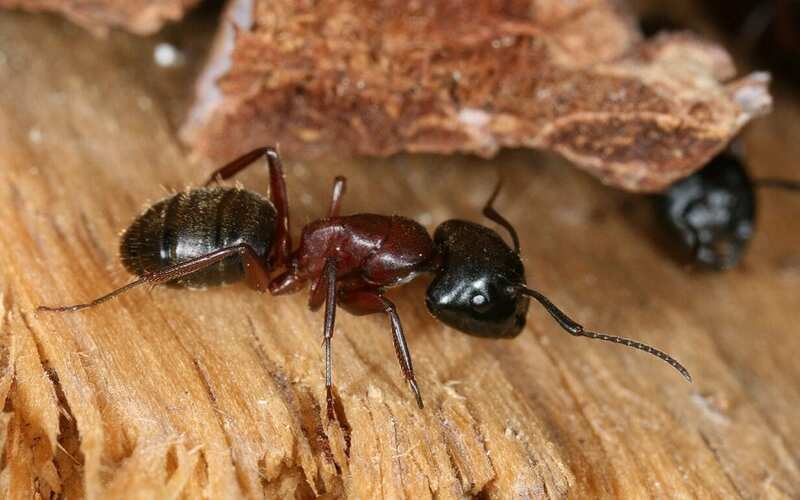 Carpenter ants do not eat wood, but they will make nests inside damp or decayed wood for their colonies. The adult ants are large and are about 1/4 to 3/8 inches long. They can be dark brown, black, red, or yellowish. Most often they are brown or black. They feed on plants, animal food, sweets, and other insects. Signs of an infestation include rustling sounds in the walls and wood shavings underneath wooden objects. Many of these insects are small and if they are present in the home, they will be deep inside the walls, floors, and furniture. A licensed professional can conduct a pest inspection to look for damage or other signs of insect activity. They will also examine the home for conditions that are attractive to insects. The inspector will record his findings on a pest control inspection report. Whether you plan on staying in your home for many years, are planning on selling your home, or are looking to buy a home, it is important that the house is free of any type of wood-destroying insects. By the time you see definite evidence of these insects, it is often a deep infestation, so it is best to have an inspection and catch an infestation early. Inspector Ed Home Inspections provides inspection services including WDO inspections to New York City and Long Island. Contact us to book our services.